Tanzanian international Haruna Moshi has returned home to doubts and questions after failing to impress in the Swedish first division. Moshi had signed a two-year contract with Swedish premier league side Gefle IF last year but the deal was brought to an end earlier in July. He said he found life in Sweden difficult and had no option but to terminate his contract and return home. 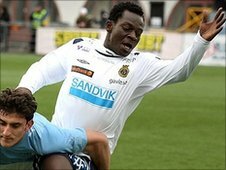 But the player's agent Damas Ndumbaro has attacked his client for squandering a superb chance. "He had an opportunity to excel and play in the [European] Champions League, which he has now squandered," Ndumbaro said. Ndumbaro said that one reason Moshi had come back to Tanzania was because he did not wanted to pay Swedish taxes. But the Gefle IF coach denied that there had been any problems with Moshi. "Moshi has many good qualities but he found it difficult to adjust to our system," Per Olsson told the BBC. "We have both agreed that this [terminating the contract] was the best solution, and there were no hard feelings," he added. Tanzanian fans are disappointed that Moshi's career in Europe is apparently over. There are no Tanzanians playing at a high level in Europe.